There’s a meme among some Steven Universe fans that consists solely of comparing one of the show’s lighthearted early episodes to the darkness and emotional maturity of its more recent fare. Early on, this was completely sincere, but after enough iterations, a counter-meme developed: giving an earlier episode a terrifying description and a later episode a totally benign one. Like all memes, both the earnest and ironic versions of the comparison have been killed more thoroughly than Hitler in Inglourious Basterds. But that doesn’t change the underlying fact that Steven Universe, almost four full seasons into its run, has evolved from its origins into a fundamentally different show. That’s the chief appeal of “Tiger Philanthropist,” whose title and wrestling-heavy subject matter are direct references to “Tiger Millionaire,” the ninth episode of the series (airdate: January 20, 2014). “Tiger Philanthropist” is a perfectly decent installment of Steven Universe, the latest in a long line of episodes about Steven and Amethyst’s sweet, heartwarming quasi-siblinghood, but it doesn’t really develop anything new on that front. Amethyst largely overcame her once-signature self-loathing with Steven’s help in a magnificent Season Three story arc; since then, their relationship hasn’t really been touched, what with the show shifting its focus onto the Steven-Rose Quartz dynamic and Steven’s increasingly fragile mental state. This could have been the perfect moment for a flipping of the script, with a now-secure Amethyst trying to help Steven cope with the jumbled mess inside his mind. Instead, “Tiger Philanthropist” feels more like the tying-up of a loose end, an epilogue deliberately juxtaposed with its ancient predecessor’s versions of Steven and Amethyst to show, in the immortal words of Matchbox Twenty, how far we’ve come. There’s nothing explicitly wrong with that, of course, and as is usually the case, Steven Universe executes well. Amethyst’s movement from self-involved serenity to fierce, apologetic care develops with ease; Steven’s empathy is no good at resolving his anxiety, and he nearly succumbs to a sacrificial, sad solution; all the while, the self-aware puns and stylized fight scenes in the ring give “Tiger Philanthropist” an aura of unreality that befits Beach City’s take on pro wrestling. But given the depth the show has accumulated, even since the beginning of its fourth season, I couldn’t help but feel like it left some potential on the table here. 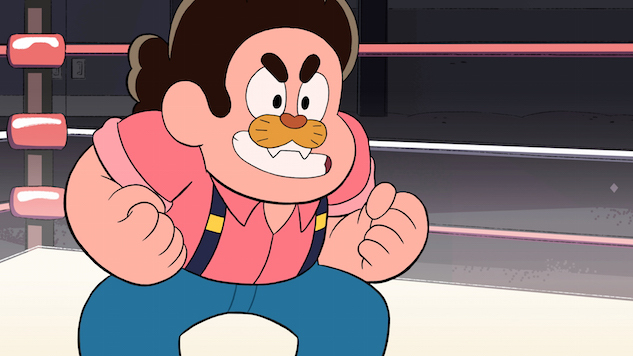 Perhaps the main lesson of “Tiger Philanthropist,” then, is to show that Steven Universe is no longer capable of fully capturing the carefree spirit of its halcyon days, and that it no longer even needs to strive for that. Just as Steven and Amethyst have developed a far deeper relationship between the events of “Tiger Millionaire” and the present (they’ve fused, for heaven’s sake!) and can move on from wrestling as their bonding activity, the show itself has set its own emotional bar at such a level that certain stories will no longer cut it. In this interpretation, “Tiger Millionaire” serves as a stand-in for many of the early episodes that focused more on weirdness or action than upon character development—”Arcade Mania,” “Onion Trade,” the utterly terrifying “Frybo”—and gives up the Beach City Tag Team title belt to the show’s new order. That doesn’t mean that SU should only give us episodes like “Storm in the Room; and shy away from pure fun; in fact, September’s “Last One Out of Beach City; which I would have awarded at least a 9.5/10 if Paste had rated episodes back then, is proof that this show is at its best when its character development is also a total blast. But at this point, a superior Steven Universe selection must always choose to prioritize emotional progress. By putting a bow on a character arc, “Tiger Philanthropist” seems to acknowledge this truism. All that said, it’s still instructive to recap where Amethyst and Steven each are at this point. As for Steven, all the boy wants right now is some love, which he can only get with a little help from his friends. Rather than discovering some new internal purpose in wrestling once Amethyst departs, Steven’s whole shtick centers upon making Lars happy. The very fact that Steven cares about Lars—the archetype of the faux-aloof, insecure teenage boy, a subset of humanity that terribly needs love but excels at pushing it away—has always been a marker of Steven’s empathy. But as with other recent instances of his extreme selfless behavior, it leaves him weary and somewhat despondent. Lars won’t reciprocate; Amethyst will. Even though “Tiger Philanthropist” doesn’t take their relationship to the next level, it does show us that Steven and Amethyst can take total solace in each other’s company… and perhaps, for now, it’s enough just to provide Steven with an escape from his own psychological turmoil. My above critiques notwithstanding, this episode did have an incredibly charming ending, a cherry on top within a cherry on top. I’ve discussed this before, but Steven is really, really strong, and he wasn’t holding back against those other wrestlers at all. It goes to show that wrestling is a total escape for Steven, who would never even consider using that level of force if he thought this were for real. The Lars-Sadie dynamic will never not make me smile. It’s been awhile since we’ve seen them, but their tacit mutual crush and complicated relationship is the best thing to come out of the show’s Beach City slice-of-life episodes. The monochromatic, comic book-like smackdown frames toward the end of the episode are exquisite. I’m happy for the Good-Lookin’ Gang, the new Beach City Tag Team champions, but I would’ve liked to see Shark-o-Mania get some redemption. Were those… real dollar bills Steven was tossing out to the crowd? I suppose Greg doesn’t need most of his massive fortune. Zach Blumenfeld was sorely tempted to cross-post this review to Paste’s wrestling section, but he wasn’t sure if that would be okay. Follow him on Twitter.